Posted on 1, February 2019 by EuropaWire PR Editors | This entry was posted in Automotive, Germany, News, Technology, Transportation & Logistics and tagged 46-litre fuel tank, 8-speed Steptronic transmission, acceleration, BMW, BMW 7 Series, BMW 745e, BMW 745Le, BMW 745Le xDrive, CO2 emissions, electric motor, electrically powered range, emissions-free driving, EV, exhaust emission, fuel consumption, high-voltage battery, hybrid cars, interior fragrance, interior shading, interior temperature, lithium-ion battery, luggage compartment, NEDC, plug-in hybrid, seat conditioning, seat massage, system torque of 600 Nm, WLTP test cycle, xDrive. Bookmark the permalink. MUNICH, 1-Feb-2019 — /EuropaWire/ — BMW unveils advanced plug-in hybrid models for the start at the market launch of the new BMW 7 Series in spring 2019. The new models are sporty, offer comfort, high level of efficiency and the possibility to enjoy purely electrically powered, locally emissions-free and virtually noiseless driving experience. They come in three different model variants: The BMW 745e, the long version BMW 745Le and the BMW 745Le xDrive with extended wheelbase and intelligent all-wheel drive. Their plug-in hybrid system now includes a 6-cylinder in-line petrol engine and a further advanced high-voltage battery with enlarged capacity. There is a significant boost in output and torque as well as improved figures for electrically powered range, fuel consumption and CO2emissions as compared to previous models. The new models’ plug-in hybrid system is based on the current BMW EfficientDynamics engine family that has been adapted on a model-specific basis to produce a peak output of 210 kW/286 hp. The electric motor is with a rated output of 83 kW/113 hp and a rated torque of 265 Nm, along with a new lithium-ion battery featuring the very latest battery cell technology and expanded storage capacity. An intelligent energy management takes care for the precisely controlled interaction between the two power units and – with activated preview function – efficient assignment of the electrical driving share to those route sections which are supposed to be covered with zero emissions. The electrically powered range of the new BMW 745e is between 54 and 58 kilometres, while the new BMW 745Le reaches 52 to 55 kilometres. The new BMW 745Le xDrive achieves an electrically powered range of 50 to 54 kilometres. The new plug-in hybrid models of the BMW 7 Series rely on a new high-voltage battery that has a gross energy content increased to 12.0 kWh. The increased storage capacity of the lithium-ion battery guarantees purely electrically powered, locally emissions-free and noiseless driving well beyond the sphere of urban mobility. When in HYBRID mode, the new models can travel at a speed of up to 110 km/h – 20 km/h faster than the previous models – in purely electric mode. The petrol engine is not switched on until a higher speed is reached that requires a particularly high load. The power of the electric motor alone, in ELECTRIC mode, is more than enough to reach a speed of 140 km/h. When in SPORT mode, an overall system output of 290 kW/394 hp is available. For a particularly powerful set-off manoeuvre, it is even possible to draw on a maximum system torque of 600 Nm. In terms of acceleration the new BMW 745e makes it in 5.2 seconds from zero to 100 km/h, while the new BMW 745Le takes only 5.3 seconds. At the same time the new BMW 745Le xDrive reaches the 100 km/h mark from standing position in just 5.1 seconds. The maximum speed for all three models is electronically limited to 250 km/h. The fuel consumption and exhaust emission figures have also been further optimised. The electric motor of the plug-in hybrid models is integrated in the 8-speed Steptronic transmission. It acts as a generator, feeding energy into the high-voltage battery by means of recuperation, when in braking and coasting phases. The luggage compartment volume of the plug-in hybrid models is however slightly restricted to make room for the high-voltage battery, which is positioned underneath the rear seats and the 46-litre fuel tank, which is located above the rear axle. However, the luggage volume of 420 litres can be expanded as needed by means of the standard 40 : 20 : 40 split and fold function offered by the rear backrests. The exterior design Pure Excellence and the M sports package are available as options for new BMW 745e, the new BMW 745Le and the new BMW 745Le xDrive. 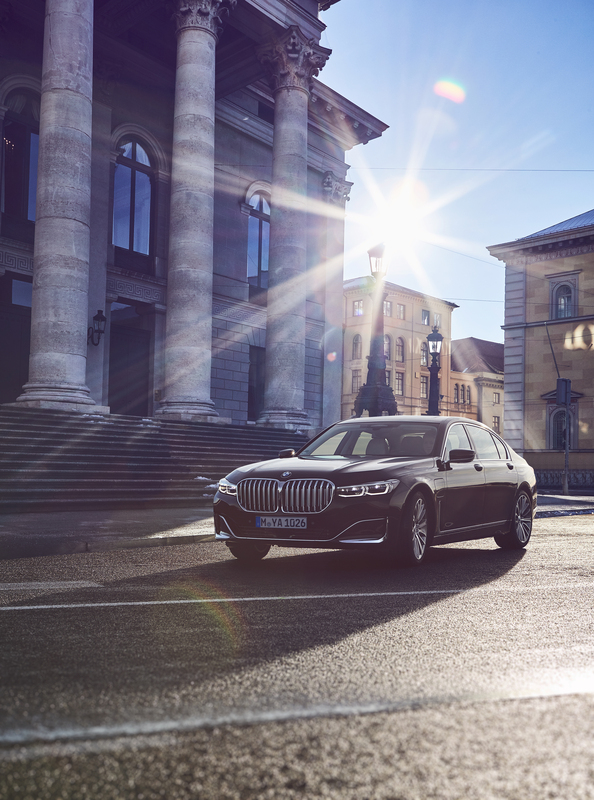 New digital services will be available for the plug-in hybrid models of the BMW 7 Series in the summer of 2019. Among others, the navigation system will recommended nearby hotels, restaurants, cafés, tourist attractions and cultural institutions when selecting a public charging station. Particularly helpful will be the prediction for the occupancy of the selected charging station. The driver can even reserve a suitable charging station for a limited amount of time directly from the car. Among others, things like combination of seat conditioning, seat massage, interior temperature, fragrance and shading based on specifically defined Experience Modes can also be chosen by the BMW Intelligent Personal Assistant. The BMW Intelligent Personal Assistant can also help with searching for parking spaces and charging options.